The service is excellent every since we have had Randall coming out we have had no problems with answer any kind of bugs excellent. Thank you for providing us with a 5 star review! We are happy to hear that Randall has been able to help you with your pest issues. Thank you for being such loyal customers throughout the years we appreciate you and your business. Have a wonderful afternoon! We appreciated the timely service and excellent customer interaction! Thank you for providing us with a review! We are happy to hear that you are satisfied with our service. Thank you for giving us the opportunity, and welcome to the Signature Family, have a wonderful day! You will not find a better company to help you keep termites from damaging your property. I have had this company for over 5 years and do not intend to have anyone else inspect and kill any termites found in or under my house. Thank you for providing us with a 5 star review! We are happy to hear that you are satisfied with our service. We would like to thank you for being such a loyal customer throughout the years. If you need anything don't hesitate to give us a call. Have a wonderful day! Gus was extremely friendly and efficient with our first visit .Made me comfortable to proceed with this company’s services. On the day of he was very professional, in contact with me in regards to any findings etc. so far so good 😊. Thank you for providing us with a 5 star review! We take pride in the service we provide in the field and in the office. Have a great day! Excellent service. Great to deal with! Thank you for providing us with a 5 star review! We are glad to hear we were able to provide you with an great experience. Thank you for giving Signature Pest Control the opportunity. If you need anything else don't hesitate to give us a call. Thank you, have a wonderful day! Everyone at Signature was great! Lupe set up the appointment and Sean was right on time! He obviously has a lot of experience and was very thorough! We highly recommend Signature! Thank you for providing us with a 5 star review! We are happy to hear that we were able to provide you with a great experience. We take pride in the service we provide in the field and in the office. Have a great day! Thank you for providing us with a review! We really appreciate you and your business. We are glad to hear that you are satisfied with our services. Have a great day! Would absolutely recommend. Very friendly, honest and good experience all around. Thank you for providing us with a 5 star review! We are happy to hear that we were able to provide you with a great experience if you need anything else don't hesitate to give us a call. Thank you, have a wonderful day! Thank you for providing us with a review! We are pleased to hear that you are satisfied with the work that was completed. If we can be of any other assistance let us know. Thank you for your business, have a wonderful afternoon! We’ve used this service for almost 17 years. They’re timely and professional. Our technician, Randal is very thorough and to us he takes ownership as if he’s the company’s owner. You can trust Randal to be on your property. Thank you for providing us with a 5 star review! We are glad to hear that you have been satisfied with your service throughout the years. Thank you for being such a loyal customer, we really appreciate you and your business. If you need anything else don't hesitate to give us a call. Have a wonderful day! Very thorough, quiet and polite. Thank you for your 5 star review for the termite renewal inspection completed at your home today. I will forward the info you've provided to the Gen Mgr and your inspector Sean. We appreciate you and your business. Have a beautiful day! 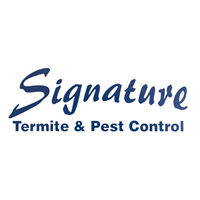 We were very pleased with the services we received from Signature Pest Control. We would highly recommend them. Thank you for the 5 star review, and the kind worded review. We appreciate it, and we look forward to servicing you in the near future. Thank you and have a great week. Everyone and everything that happened for us was terrific. They went the extra mile in making sure all the issues were handled. Their entire staff and owners were top notch. I would highly recommend them to anyone. Thank you so much for your 5 star review! We are pleased to hear that you are satisfied with our services. Thank you for giving Signature Pest Control the opportunity to service your home! We really appreciate you and your business, if you need anything else don't hesitate to give us a call. Have a wonderful day! Thank you for providing us with a 5 star review! We are happy to hear that you are pleased with our service. Thank you for joining The Signature Family we really appreciate it. We can't wait to see what the future holds for us. Have a wonderful weekend! Thank you for providing us with a review. We are happy to hear that you were satisfied with our service. Thank you for giving us the business opportunity. If you need anything else don't hesitate to give us a call. Have a wonderful evening! Couldn't imagine using any other pest control company for personal services or to refer to my real estate clients! Thank you for your review! We really appreciate you and your business. Thank you for trusting us to service you. If we can do anything else don't hesitate to give us a call. Have a wonderful day! Awesome service! Fast and efficient! Thank you for providing with a 5 star review! It was a pleasure working with you, we look forward in servicing you in the future. We try our hardest to provide the best customer service whether it's in the field or in the office. If you need anything else don't hesitate to give us a call. Have a wonderful week! Everything was done well: Inspection, efficient in providing documentation, good communication, quick scheduling of work and its completion, and the convenience of billing to escrow. Thank you for providing us with a review! We are pleased to hear that we were able to provide a great experience! Thank you for giving us the opportunity to work with you. We look forward to service you in the future, if you need anything else don't hesitate to give us a call. Have a wonderful weekend! Good service and fast , will ues this company again for sure. Thank you for providing us with a review! We are happy to hear that we were able to help you with the termite inspection. We try our hardest to provide the best customer service. We are excited to see what the future hold for us. Have a wonderful day! Great service!!! From the initial inspection to the repairs. Every tectnition that came to our home was very professional and went above and beyond to take care of our problem. The technicians that came to do the repairs sealed all the areas in the work order and others one they found that they felt needed to be sealed. I was never nickled and dimed and a service I didn’t need was never offered. Thank you! Thank you so much for providing us with a 5 star review! We are really happy to hear that we were able to provide an excellent experience. Thank you for giving us the opportunity to service your home. If you need anything else don't hesitate to give us a call. Have a wonderful day! Superb service, friendly and considerate. 😊. Thank you for taking the time to provide a 5 star review. Signature Pest Control thanks you for your continued loyalty as a customer since 2009. We appreciate you and your business. If we can assist you in other areas of pest control or termite related inspections/treatments please don't hesitate to contact our office. We thank you and wish you a wonderful weekend ahead! The girls in the office are very friendly and efficient, always responding promptly. Sean the inspector is always courteous, efficient and on time. Very satisfied with Signature as a Real Estate Professional I highly recommend this company. Thank you for giving us a review! We are happy to hear that you are satisfied with our service. Thank you for being a loyal customer and continually using our services. If you need anything else don't hesitate to give us a call, have a great weekend! Signature Pest Control was able to squeeze in last minute appointment for my sellers. The inspector & office staff were friendly & attentive to all details. I highly recommend this company for your next inspection! Thank you for giving us a 5 star review! We are pleased to hear that we were able to help you with your inspection. If you need anything else don't hesitate to give us a call! Have a wonderful weekend. I am delighted with the good service and excellent communications with Signature Pest Control. I definitely recommend this company. Thank you for providing us with a review! We really appreciate you and your business. Thank you for your feedback we try our hardest to provide the best service possible. Thank you for being a loyal customer, if you need anything else don't hesitate to give us a call! Have a wonderful day. Signature pest control was awesome. They came out right away and I was super happy with the result. The staff was professional and courteous and the price was right. I would recommend them. Thank you for providing us with a review! We are happy to hear that you were satisfied with our service. We really appreciate you and your business if you need anything else don't hesitate to give us a call. Have a wonderful day! Signature Pest Control Company is dependable, timely, and thorough. Very professional and personable. They want to be assured that the customer is satisfied with the completed task. Thank you for providing us with a 5 star review we really appreciate it! We are happy to hear that you are satisfied with our service. Thank you for the opportunity you gave us to service your home. If you need anything else don't hesitate to give us a call. Have a wonderful weekend! Always friendly and they took care of every concern I have. Highly recommended! Thank you for providing us with a 5 star review! We are happy to hear that you are satisfied with our service. If you need anything else don't hesitate to give us a call, have a wonderful weekend! Randal has been very accommodating and always a pleasure to talk to when he calls 24hrs in advance of his arrival. The office team has also been swift to schedule one-off sprays. Good job! Thank you for the great review, we appreciate the beautiful 5 stars and kind words. We are glad that we have you a part of our Signature Family. Great company to work with !! Highly recommend. Reasonable pricing and don’t sell/ recommend things you don’t need! - Marcus. Thank you for providing us with a review! We are happy to hear that you are satisfied with our company. We try our hardest to provide the best customer service. Thank you for being such a loyal customer throughout the years. Have a wonderful week! Fast accommodation, and experience technicians that are friendly and very professional. Know how to take care of the client in my case being a Realtor, I schedule an inspection for a 12/31/2018 last day of the year and they still showed up. Thank you for your services. Thank you for the kind review, we appreciate it. Of course we showed up, we can't let a customer down. We look forward to working with you in the near future. Thank you again, have a great week. Gus was great, and the customer service was excellent. Thank you for providing us with a review we really appreciate it. We are happy to hear that you are satisfied with our service. If you need anything else don't hesitate to give us a call. Thank you have a wonderful weekend! I received awesome service today!! The inspector was gracious and kind. He even came out New Year’s Eve to help! Thank you for providing us with a 5 star review we really appreciate it! We are happy to hear that we were able to provide an excellent experience. If you need anything else don't hesitate to give us a call. Thank you have a wonderful day! Awesome customer service, punctual tech's and wanting to find the root cause of the issues not just "spray and go". I had rats and gophers and spiders for years due to the area I live in and despite my efforts of keeping the yard clean and cleared, I lost a few fruit trees but the problem was not me but my neighbors and the other pest control companies. I don't have these issues since I have Signature pest control service my home. Thank you Randell and Paul and the team. Happy holidays to you all. Signature Pest Control THANKS YOU, for your great review and your business. We try and treat every customer as if you are our own family. We are happy that you are pleased with our technicians and the service we provide at your home.We look forward providing your home the best service in the industry. May you and your family have a Safe and Blessed Holiday Season! I met Sean at the site and he was very courteous, knowledgeable and very friendly. I would use your company again because he represents your company in a very good light and it was a pleasure speaking with him. Thank you for the 5 stars and the review. We are so happy that your happy. We look forward to working with you again in the near future. Signature thanks you and wishes you and your family Happy Holidays. I have been with Signature since day one and is very happy with the overall service. Signature just wants to thank you for being a loyal customer throughout the years, and for the 5 stars as well. We look forward to many more years of service. Thank you, and Happy Holidays. Thank you fro leaving a 5 star review. we really appreciate it! We are pleased to here that we were able to provide great service! Thank you for giving Signature Pest Control an opportunity to service your home. Have a wonderful weekend & Happy Holidays! Technician that does my monthly service is very competent and friendly. Thank you for providing us with a review! We are happy to hear that your technician is providing great service. We try our hardest to provide excellent service whether its in the field or in the office. Thank you for being such a loyal customer, have a wonderful weekend & Happy Holidays! Awesome Company....I have used them personally at my home and also in my real estate transactions as a realtor in the area. They are honest and professional and their pricing is fair......always pleased with the finished work.....you can put your trust in Signature Pest Control. Thank you for taking the time out of your busy schedule to provide us with a review. We are happy to hear that we have continued to provide you with excellent service. We try out hardest to provide the best customer service whether it is in the field or in the office. Thank you for continuously using our company. Have a wonderful day, and Happy Holidays! Always professional, courteous and prompt. SPC is the best! Thank you for the 5 star review we really appreciate it! We try our hardest to provide the best customer service we can whether it's in the office or out in the field. Thank you for being such a loyal customer. Have a wonderful day! We are very happy with our service, especially Omar. He is the best. Thank you for providing is with a 5 star review, we really appreciate it. We are happy to hear that you are satisfied with our services. We take pride in the service we provide in the field and in the office. Have a wonderful day!